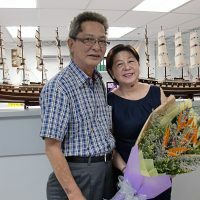 Heng Lee Enterprise Corporation, established in 1971 by Eric Lim and his wife Susie Lim, has always offered their best services to ship owners, Master and crew. Heng Lee Enterprise is committed to fulfill customers need for quality supply, logistic and agency services. Heng Lee Enterprise Corporation, established in 1971 by Eric Lim and his wife Susie Lim, has always offered their best services to ship owners, Master and crew of all types of vessels and of different nationalities from Europe and Asia. The value of human dignity is one of the cornerstones of HLE its operating philosophy. We value long-term relationships – with business partners, customers, suppliers and our own staff. We will strive for excellence in everything we do, driven by a sense of urgency and a desire to meet your needs. That combination of the personal touch with professional pride is where we go for. We do this with our team of approx. 25 highly motivated and experienced colleagues, who are 24 hours a day – 7 days a week ready for you to execute your order as quickly and smoothly as possible. This is HLE. We look forward to work with you!